How are 3D products made? A 3D body scanner takes pictures from many different angles around the person/pet/couple family you are trying to capture. After a couple of different captures, a customer will review the photos from each capture and decide which ones they want to have processed into 3D Preview Models. A 3D Preview Model is a 3D model we process as soon as the raw photo data from the Twinstant Mobile is submitted to the Twindom Cloud Platform for processing. The purpose of the 3D Preview Model is to provide a basic, digital representation of the final 3D printed figurine while the customer is still onsite. 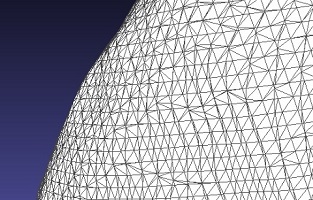 In contrast to the full resolution, 3D Print Quality Model that is processed when a customer places a print order, a 3D Preview Model is processed using only a minimum viable amount of data (~15 MB) to speed up the processing time (5-10 minutes) and ensure proper transfers on poor internet connections. 5-10 minutes after submitting the raw photo data to the Twindom Cloud Platform, a customer can review their 3D Preview Model and decide if they want to purchase a 3D printed figurine while they are still onsite. Do I need special 3D modeling software? 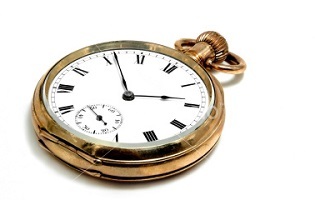 What if a customer doesn’t have time to wait the 5-10 minutes? Do I need to wait for 1 scan to finish processing to run a scan of another customer? No, the Twinstant Scanner App (installed on the laptop that comes with the Twinstant Mobile) has a built-in 3D viewer for displaying 3D Preview Models. If a customer doesn’t have time to wait for their 3D Preview Model to finish processing, you can either tell them to come back later or let them check out their 3D Preview Model online on their smartphone via your custom branded online store. When a 3D Preview Model is done processing on the Twindom Cloud Platform, an email is automatically sent to the customer with directions on how to login to their online account. No, once the raw 2D photo data is submitted for processing to the Twindom Cloud Platform you are free to continue running more scans on your Twinstant Mobile full body 3D scanner. Depending on which subscription plan you are on additional 3D scans you submit will either process in parallel or be queued behind 3D scans that are already being processed. Next, place orders through the Twindom Cloud Platform’s built-in point of sale system or have customers place their own orders via your custom-branded online store. Can I use my own POS? In order to accept payments you will need to setup a Stripe or Paypal account and link it to your own bank account. When a customer pays for a print through your Twindom online store or your Twindom POS the entire retail price you charge your customer is automatically sent directly to your Paypal or Stripe account. Stripe and Paypal allows you to accept payment in almost all major world currencies. The fulfillment costs for the 3D printed figurines are then automatically billed to a credit card we keep on file with your Twindom Cloud Platform account. All fulfillment costs that are billed by Twindom are in USD. Almost all major world currencies are supported. These include: USD, EUR, AUD, CAD, INR, ILS, GBP, JPY, CNY etc. If you don’t see your currency listed please contact sales@twindom.com to verify. Once a 3D printed figurine order is placed, the 3D Preview Model is reprocessed on high-powered servers. This process greatly enhances the quality of the 3D Preview Model and creates a 3D Print Quality Model. Why isn’t reprocessing done on all 3D Preview Models? When a 3D Preview Model is reprocessed into a 3D Print Quality Model it is processed on multiple high-powered servers that are very expensive to run. Due to the higher cost, it is cost prohibitive to run them for every 3D scan generated by the Twinstant Mobile. The reprocessing also takes multiple hours to complete which makes it impractical for showing customers a preview of their 3D printed figurine onsite. The high-powered servers are only used when a 3D printed figurine is ordered. The 3D Print Quality Model now needs to be reviewed by a 3D artist. A 3D artist uses specialized 3D software to fix problems that the reprocessing wasn’t able to fix. No, there is no 3D modeling work you need to do after a customer places their order for a 3D printed figurine. 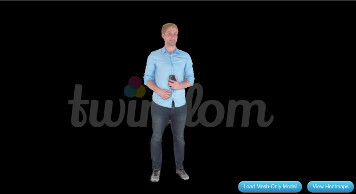 Every 3D printed figurine placed through the Twindom Cloud Platform is review and fixed by a 3D artist from Twindom. There is no extra fee for this, as it is built-in to the fulfillment costs. Click here to download fulfillment pricing. After the 3D artist review, the 3D model still needs more work to make sure it’s fit to go into a 3D printer. This includes running 3D printability checks on the 3D model, scaling the 3D model to the correct size and minimizing the amount of material needed to create the 3D printed figurine. The full-color 3D printing process takes anywhere from 2 to 20 hours depending the size and number of 3D printed figurines in the build. Why do most 3D printed figurine companies outsource the 3D printing? How much does it cost to print with Twindom’s print network? What type of 3D printer is used for 3D printed figurines? Where are Twindom’s 3D print partners located? Full color 3D printers are very expensive (+$100,000 upfront investment) and difficult to run reliably (1 in 3 prints need to be reprinted because of printer errors), and there is only 1 type of printer on the market that can print 3D printed figurines with high enough quality: the Projet 660 by 3D Systems. If you end up getting a Projet 660 for your 3D printed figurine business you will likely spend more time dealing with the printer than you will actually 3D scanning customers, which is why most 3D printed figurine companies outsource the 3D printing to companies that specialize in it. If you do end up deciding to get your own 3D printer, here is an article that explains all of the steps of the printing process. The only full color 3D printer on the market suitable for making 3D printed figurines is the Projet 660. Click here to learn more. Twindom currently has customers operating in +10 countries. Contact sales@twindom.com with your desired country and a sales representative will get in contact with you. 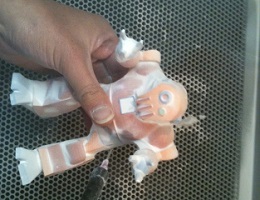 After 3D printing the 3D printed figurines need to dry in a heated chamber for at least 1.5 hours. This strengthens the 3D prints and prevents them from breaking when they are removed from the full-color 3D printer. 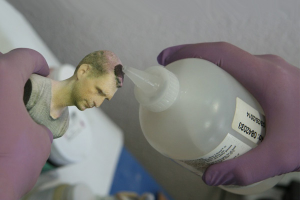 After the 3D printed figurines have strengthened, it is safe to remove and depowder them. Once all the excess powder is removed the 3D printed figurines go through quality control. One in three 3D printed figurines usually needs reprinting or additional post processing before it can advance to the next step. Why is there such a high reject rate? 3D printing is still a relatively new technology that relies on lots of complex mechanical movements. When you add 1000s of these complex mechanical movements together there is a good chance that the 3D printer will fail with at least one of movements leading to problems such as delamination or color shift. This is why it’s very important that the 3D printer used to print the 3D printed figurines is very well maintained. After depowdering, the 3D printed figurines are dipped in cyanoacrylate. The cyanoacrylate further strengthens the 3D printed figurines and makes the colors more vibrant. Finally, the 3D printed figurines are matched with customer addresses and packed into boxes before shipping. What happens if a 3D printed figurine breaks in shipping? 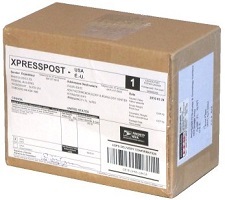 All packages that are shipped from Twindom print partners are specially packed to minimize any chance of breakage. If a 3D printed figurine does break in shipping, all packages carry insurance and we assist the customer with filing a claim. Please contact sales@twindom.com to get the most up to date shipping prices. Need to know product fulfillment pricing?